Sandor receives a visit from Claims Conference staff member Merry Firschein. Sandy and his wife are both Holocaust survivors. Despite health problems, they continue to volunteer and regularly speak in the community about the horrors they experienced during the Holocaust. Sandor and Katherine Tambor survived the horrors of the Holocaust incarcerated in Nazi concentration camps. Now living in Florida, they say that they can remain safely in their own home only with the help of a Jewish social service agency in West Palm Beach, funded by the Claims Conference. Like the Tambors, hundreds of other elderly and frail Holocaust survivors in Florida receive aid from the Claims Conference though $23 million in allocations to five Jewish social welfare agencies, including Alpert Jewish Family & Children’s Service (JF&CS) in West Palm Beach. 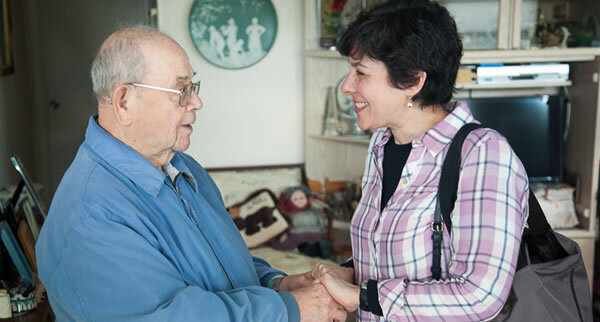 These desperately needed funds enable these organizations to provide Jewish Holocaust victims with in-home care, transportation, food, medical care, case management, emergency cash assistance and socialization programs. With Claims Conference support, Alpert JF&CS annually assists approximately 400 Holocaust survivors in Palm Beach County and in the Jacksonville area. Claims Conference funding – $2.84 million for 2016 – is crucial in enabling Alpert to fulfill its mission of helping survivors live at home in dignity, says CEO Jenni Frumer. The home help and financial assistance Leah receives allows her to remain independent and in her own apartment. Claims Conference programs provide a network of care for Holocaust survivors around Florida. And though Alpert also receives limited State of Florida funds for outreach to survivors, the unmet needs of Holocaust survivors, most of whom are in their 80s and 90s, are constantly growing. “We hear about two new clients a week, which means eight new Holocaust survivors a month that we didn’t even know existed in our community,” Jenni says. A portion of Claims Conference allocations can be used towards “exceptional hours” – homecare hours that are additional to the standard number a low-functioning survivor might typically receive. A small number of exceptional hours can make a huge difference for an elderly survivor who needs care at home. Recently, a husband and wife, both Holocaust survivors, had a difficult problem. It was the one-year anniversary of the death of the wife’s daughter from her first marriage, and the ceremony to unveil the gravestone would be in New York. The woman was desperate to go, but her husband is ill and too frail to be left alone at home. Alpert used “exceptional hours” funding to provide this man with additional homecare help, so his wife could attend the unveiling ceremony at her daughter’s grave. The Tambors, Holocaust survivors from Hungary, live in a small apartment in a large over-55 community in West Palm Beach. Sandor, now 94, was in his early 20s when he was deported to the Landsberg-Kaufering slave-labor camp, part of the Dachau concentration camp complex. Katie, now 88, was almost 17 when she was deported to Auschwitz with her family. When they immigrated to the U.S., Katie graduated from college and graduate school; she worked as a kindergarten and first-grade teacher in New York City for decades. Socialization programs help Holocaust survivors stay connected and ease isolation. At these events, survivors can meet others who understand them, and feel like they are part of a community. In addition, case managers use the time at social events to check in on survivors. It’s a crucial way to talk with their clients in a relaxed setting. For example, a case manager found out at a monthly gathering that a survivor’s refrigerator was leaking and wasn’t keeping food cold. Now, knowing this information, Alpert has arranged a new refrigerator for her. Claims Conference staff member Deb Kram visits social events for Holocaust survivors around the country. She answers questions about programs and services. Along with Alpert JF&CS, which also provides in-home services to Holocaust survivors in the Jacksonville area, four other agencies are partnered with the Claims Conference to provide care to Holocaust survivors in Florida: Gulf Coast Jewish Family and Community Services in Clearwater; Jewish Community Services of South Florida in North Miami; Jewish Family Service of Broward County in Plantation; and Ruth & Norman Rales Jewish Family Services in Boca Raton. In 2016, these five agencies are receiving a total of $23 million from the Claims Conference. *From the 2006 Jewish Demographic Study conducted by the Jewish Federation of Palm Beach County.